Major funding support from the Natural Sciences and Engineering Research Council (NSERC) and Western Economic Diversification Canada and industry has allowed the Centre to expand in capacity and take the key steps that are essential to the sustainability of the growing green roof and living wall industries. 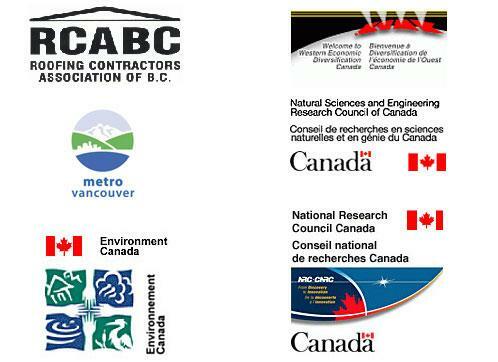 The first funds that granted the Centre its origins, infrastructure, and equipment (2002-2007) produced results describing the effects of stormwater mitigation and thermal efficiency by extensive green roofs in the climate of coastal BC. The regional infrastructure network that was established continues to collect data for further substantiations and refinements of these parameters. With major support from Western Economic Diversification Canada and matching partners in 2007, the Centre is expanding its research capacity. Elaborated study of ecological interfaces within the built environment has captured the imagination of designers, architects and the general public. For more details on the new front of green roof and living wall research at BCIT, visit our Research page.